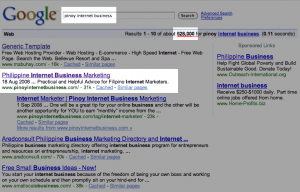 As of this writing, I also have good rankings on the keywords: ‘filipino internet business’, ‘pinoy online business’ and ‘pinoy online marketer’. Again, this site is less than 1-month old yet have good search engine rankings. You would ask: why bother getting high rankings in search engines? Then, you would ask, how can I improve my site’s SEO? Exactly, a good question. There is NO only one way of improving SEO on your site. In fact, it is a result of properly implementing every detail on your site – content, page titles, images(alt tags to be exact), internal linking and use of h1 and h2 tags among others. I’ll not go into detail on technical side of SEO (I will in the future articles) but I’ll share to you a very important concept of setting up a website that leads to good search engine rankings. That concept is NICHE MARKETING. Niche Marketing is selling to a sub-category of a given market(or topic). Better yet, it is the sub-category of sub-categories. For example, instead of giving weight loss program for everybody setup a program for women only. Making it more niche, setup weight loss program for female teachers. In that way, people will be more interested in buying since the product will exactly “fit” with them. Another example, learn-to-golf program for engineers instead of golf program for everybody. This site is another good example. There are many people/websites talking about how to make money from the internet but I’m targeting its sub-category(niche) which is “how Filipinos(or any citizenship) can make money from the internet”. 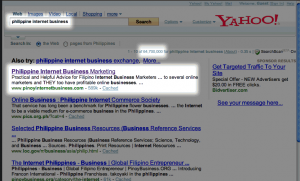 Now, it is more specific and Filipinos will be more interested on the site since it is targeted to them. Niche. 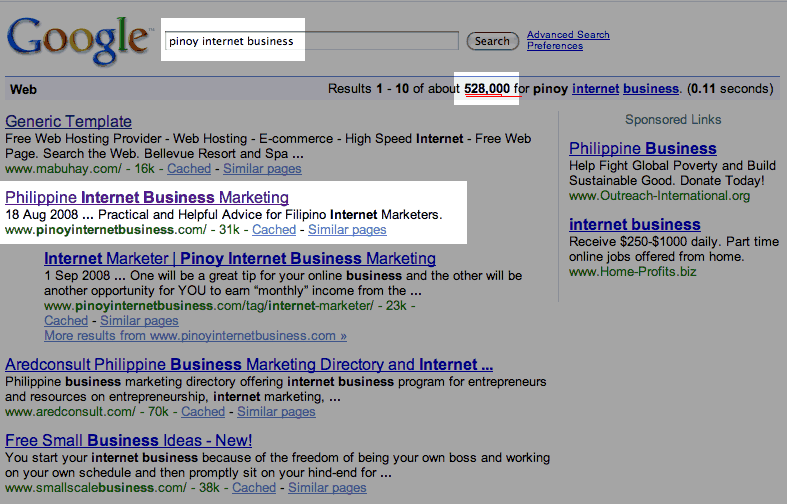 However, my niche market is still a big sub-category since there are about 14 million internet users in the Philippines. Soon, I’ll be setting up sub-niche but for now I’ll stick with this site since there are no other sites I know which is helping Filipinos build their own online business. My mentor always says “…if you are targeting every one you are selling to no one”. Now, what does niche marketing do with search engine optimization? When you are targeting a niche market you will “naturally” speak about it on your site. Search Engines(SE) will also rank your sites according to the number of keywords found on your pages. For example, if people will search about ‘internet business’ my site will not come close to the first listings. However, if they search about ‘philippine internet business’ I’m surely #1(as of this writing) since most of my keywords are talking about Philippine internet business. On the other hand, SPAM sites are also taking advantage of this. This is what SPAM sites are doing: they flood their pages with the keywords they are targeting and eventually they’ll be ranked higher. True. BUT, they’ll be penalized by search engines VERY SOON! If sites are penalized, they are BLOCKED from the search engines. You don’t want that on your site, do you? Search engines will NOT think it is spamming if your content is legitimate. How? By talking about it NATURALLY. No wonder why it is called organic searches. 1. People will perceive you as an expert in the topic/field. 2. People are more interested to know more about you and your products/services. So, start niching your market! By the way, sign up to my RSS feed via email so you’ll be notified automatically when I publish new articles. Great article my friend on SEO! I also target particular countries when if comes to SEO, but I’ve gotten lucky lately, one of my site, on the keyword ‘Filipino’, two of my blog got on the top 8 of bing.com. How is that possible? that site is only a month old? Great job on your site! You may have targeted a highly niche website which made you on top of the rankings in just a month. Of course there are other major factors but great job on your site anyway. ensure that when you shop for that car, you really know what you’re doing and how to get the best deal.